Radishes (Raphanus sativus) are often at the top of the list of easy-to-grow vegetables, but it took me years to learn how to grow great radishes, which can actually be quite finicky. Small problems can combine to cause radishes to lose interest in plumping up, so attention to detail is needed. It is also important to make use of both radish seasons – spring and fall. Organic gardeners have even more reasons for growing radishes, because this humble vegetable also can be used to manage pests, suppress weeds, or improve the soil. My biggest beginner’s mistake (which I repeated many times) was to plant my first radishes too early in spring, while the soil was still cold. The seeds would sprout well enough, but interruptions in growth from changeable spring weather took its toll on the crop. I would get some good radishes, but many plants refused to form good roots. I have since learned to be patient and never start planting spring radishes more than a month before my last spring frost date. The best spring radishes grow when the soil is still cool, but days are getting steadily warmer. Radish seeds are fast, sure germinators, so thinning seedings to at least two fingers apart is a required step. Beyond thinning, spring radishes must be kept constantly moist; a little wet is better than a little dry. In my experience, consistent moisture is the essential key to growing radishes in the spring. Many gardeners use some of their spring radishes as trap crops for flea beetles, which theoretically draws hungry flea beetles away from rocket, spring cabbage, or other high-value crops. But for this or any other trap crop scheme to work, the problem insects must be trapped or killed rather than being allowed to disperse through the garden. To gather flea beetles from radish foliage, the best tool is a hand-held rechargeable vacuum, such as those used to remove pet hair from furniture. Radishes are widely hailed as a companion plant to repel cucumber beetles and other squash family pests, but they work best when combined with a second companion plant such as buckwheat. Used together, the radishes repel cucumber beetles while the buckwheat attracts beneficials, which serve as further deterrents. I grow more radishes in fall than in spring because they are just plain better. Instead of becoming unpalatably hot the longer they stay in the ground, the flavour of fall-grown radishes mellows as soil temperatures drop. Meanwhile, the roots get bigger yet stay wonderfully crisp. 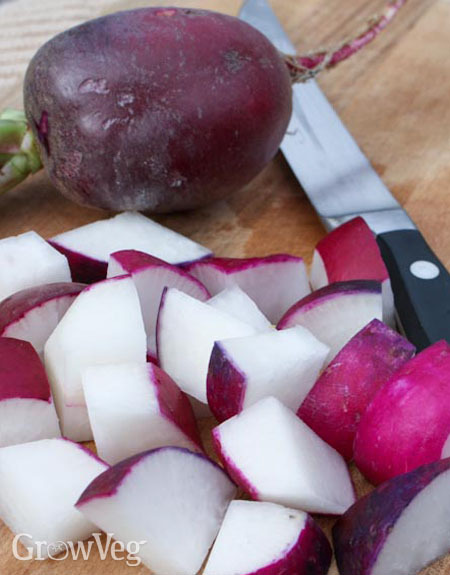 Eating even the best raw radishes gets tiresome quickly, but not so with cooked radishes, which are rather like sweet turnips, only with more colour. Autumn radishes do sometimes have cosmetic problems caused by random chewing by weevils and wireworms, but skin imperfections disappear when the radishes are cut up and cooked. At our house, we roast chunks of big fall radishes along with other vegetables, or stir-fry them for Oriental dishes. Oriental daikon radishes (Raphanus sativus var. longipinnatus) are one of my favourite fall crops. In addition to eating the long, lovely roots (cooked, please), daikon radishes produce an abundance of foliage for composting. I make several small planned sowings of daikon radishes, and use them as a fill-in crop when other fall planting plans go asunder. Weeds don’t have a chance once the daikons get going, and I love the way the roots push up out of the ground when they reach perfect condition for harvesting. Daikon radishes are at peak eating quality when they are less than 12 inches (30 cm) long, but many varieties will continue to grow much larger if allowed to stay in the garden until cold winter weather causes them to die back and start rotting. This is what you want to happen! When you use daikon radishes as a cover crop, the deep, stout roots rot over winter, creating a vein of organic matter that extends beyond your typical cultivation zone. As a "bio-drill" crop to improve soil tilth and health, daikon radishes have it all – they suppress weeds at the surface, penetrate compacted subsoil, and can easily be killed by chopping off their heads in climates mild enough to permit their winter survival. Which daikons to eat, and which to allot to the soil? The dilemma will never go away, but it is most easily handled by simply growing plenty of daikon radishes every fall. "When do you sow fall daikons? I live in western Washington. Is it too late? I do have a small hoop house so it's a bit warmer in there. " "Can daikon grow in the north of England in autumn "
"Thank you Barbara re Daikon. I have a recipe calling for these style of radish and had never heard of them. Will try to source some seeds here in Oz (Australia) and try growing them. Are they successful in spring as well?" "Did you know that if you allow the spring radishes to go to seed, you can eat the pods while they are still tender? That way you get more than just one "radish" from each plant! Taste just like radishes and look like little pea pods." "Rachel, daikons need a 60-day lead on cold weather, so August is the best time to plant them... Linda, July would be better where you are. The plants need warmth and sun when they are young, then don't mind when the weather becomes cold and clammy... Hood, diakons have been selected for such a long time as a fall crop -- it's their niche. The best reason to grow them in spring is to produce seeds, because lengthening days trigger bolting in all radishes." ""Instead of becoming unpalatably hot the longer they stay in the ground, the flavor of fall-grown radishes mellows as soil temperatures drop." Actually, I really like hot radishes and am always frustrated by all the catalogues extolling the 'mildness' of their radishes. Do you happen to know the names of some red-skinned radishes that ARE hot? Leaving them in the ground only seems to make them woody. Laurel – I've never tried leaving radishes go to seed, but these pods sound like an exotic addition to salads! Thanks for the tip. " "I plant spring radish whenever I put a garden together...but many barely pop their heads out of the ground...which is so disappointing! Since I use the tops of the "successful ones" for salads (mixed with other greens) and soups... that feels compensating to me." "Marsha, the old Black Spanish variety is always hot, so you can try that one. There also are some Chinese varieties like Shunkyo that look like short red carrots that are moderately hot with sweet undertones. " "Thanks Barbara, I'll look for them!" "Great info for a 1st time radish grower. Answers a lot of the questions I had but did not know to ask~! The whit radishes that I have are called Rabano White Icicles, many are going to seed, but I will put a second round here soon since I am in NY. I hope to have some success with these, as my gramps always had the best white radishes, which I have not seen for years. We ate them as a sandwich raw with nothing more than bread,butter, salt, and pepper. YUM~! In the meantime, I will munch on the pods as suggested by Lauren~! Thanks~!"